Work on replacing the Shelter Bay Ferry is expected to begin this year. The construction of a bigger, better ferry for the Shelter Bay to Galena Bay crossing on Upper Arrow Lake is set to begin this year. The building contract for the new $26.5 million boat was awarded to WaterBridge Steel Inc. of Prince George who will be constructing the open-decked vessel in Nakusp. The boat will be replacing two over 40 year-old vessels that are currently used for the 30-minute crossing. The new boat will transport 80 vehicles and 250 passengers. About 65 people will be needed to construct the boat over the next two years. "I'm really excited about it and I think it is great news for the community," said Nakusp mayor Karen Hamling. "It's been a really rough time, especially when the forestry went down. We've stabilized now, but we've lost a lot of young families who would love to come back." Hamling said while it is understandable some of the jobs will be filled by specialists from other communities, she has been assured local people and locally obtained materials will be a priority for the contractor. The contractor, company owner John Harding, has already secured a building site along the water, apartments for any workers coming into the community and a home for himself so he can oversee the construction, said Hamling. “This project will provide good jobs for skilled tradespeople in British Columbia," said Minister of Transporation and Infrastructure Blair Lekstrom in a press release. According to the same press release, the new boat will have "a larger vehicle and weight capacity, and faster loading and unloading times, which eliminates the need for an auxiliary ferry during the peak travel season". Hamling said the new boat should reduce ferry wait times. On the old boats, if a few chip trucks or logging trucks got on, then the boat would be at maximum weight capacity and the other travellers would have to wait for the next ferry. In a community where tourism is paramount, this, she feels, is a deterent. "With this new ferry there will be less issues with weight distribution," she said. "And that means less wait time for travellers." The community of 1,500 has been hoping for years to have a bridge built and although there will be a new ferry, Hamling is "not giving up on the bridge". 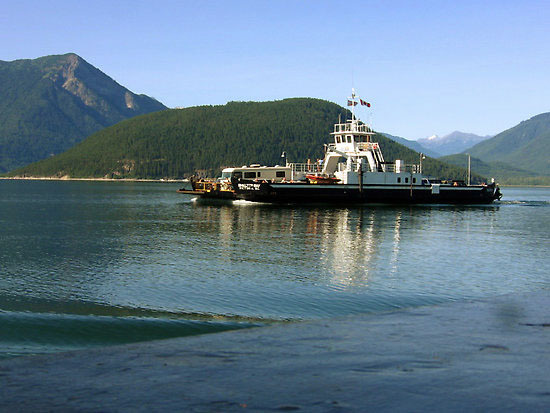 In 2011, 218,658 vehicles and 294,694 passengers used the Upper Arrow Lake Ferry crossing. For more information about the ferry schedule visit www.th.gov.bc.ca/marine/ferry_schedules.htm.